The root of perennial herb Scutellaria baicalensis Georgi of family Labiatae. Mainly in Hebei, Shanxi provinces and Inner Mongolia Autonomous Region of China. Slightly smell and bitter taste. Slender stem, yellow hard texture. Unprocessed or stir-baked, or prepaired with wine. Bitter, cold; lung, stomach, gallbladder, large intestine or bladder meridians entered. Clear heat and dry dampness, purge fire and relieve toxicity, cool blood and stop bleeding. Being bitter, cold and dry with strong actions for clearing hear and drying dampness, it can clear damp-heat of spleen and stomach, liver and gallbladder, large intestine and urinary bladder meridians, thus it is widely indicated for damp-heat syndrome. For good at both clearing heat and drying dampness and easily enter meridians of lung, stomach and gallbladder to clear excess heat at qi system, and good at relieving high fever, it is commonly used for disease of damp-warm or summer dampness with dampness and heat encumbering in qi system manifested as lingering heat, stuffiness and distention of epigastrium, vomiting and nausea with yellow greasy tongue coating. Compared with other herbs, it is used more widely. In order to achieve both clearing heat and resolving dampness and to separate and guide the pathogenic dampness and heat out, it is commonly combined with herbs for resolving dampness, moving qi and damp-draining diuretics. For instance, it is used with Zhu Ling and Bai Dou Kou together in Huang Qin Hua Shi Tang from Wen Bing Tiao Bian when dampness and heat binding in the middle energizer. For damp-heat blocking shaoyang gallbladder meridian, it is combined with Fu Ling, Zhi Qiao, Chen Pi, etc. , as in Hao Qin Qing Dan Tang from Chong Ding Tong Su Shang Han Lun (Newly Revised Popular Treatise on Cold-Induced Diseases). For damp-heat stranguria Syndrome, it is used with stranguria-purging diuretics such as Huo Fu Dan from Ben Shi Fang (Effective Prescriptions). To strengthen the actions for clearing heat and drying dampness and detoxifying in case of dysentery due to damp-heat, it is combined with Huang Lian together such as Ge Gen Huang Qin Huang Lian Tang from Shang Han Lun. 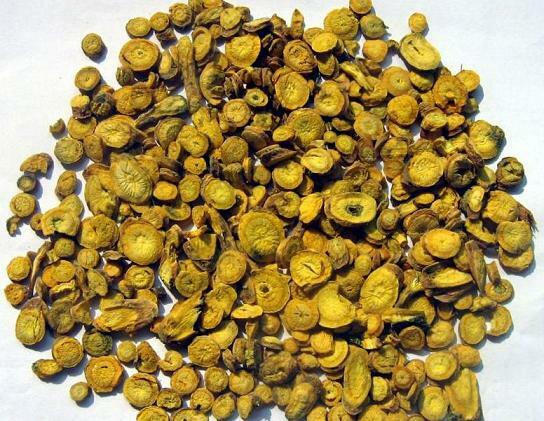 For jaundice due to damp-heat, it is used as an assistant herb for damp-excreting and anti-icteric herbs such as Yin Chen and Zhi Zi. It enters meridians of lung, stomach and gallbladder to clear heat and purge fire, for treating various excess zang-fu heat syndromes. 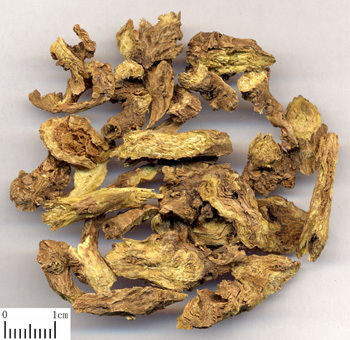 It is commonly used for cough with yellow sputum, and lung heat accumulation with failure of purifying and descending. It is effective when being used single, for instance, Qing Jin Wan from Dan Xi Xin Fa. Its actions can be strengthened by using lung-heat-purging herbs or cough-stopping and phlegm-resolving herbs together. For instance, it is combined with Dan Nan Xing, Gua Lou Ren, Xing Ren in Qing Qi Hua Tan Wan from Yi Fang Kao (Research on Medical Prescription). Being good at clearing half-exterior and half-interior heat, it is commonly combined with Chai Hu to harmonize shaoyang by dispersing shaoyang pathogen. Thercfore, it is a commonly-used herb for treating the pathogenic cold invading shaoyang with alternative fevers and chills. For instance, it is combined with Chai Hu in Xiao Chai Hu Tang from Shang Han Lun. For treating excess heat at qi system of upper and middle energizer with high fever lingering, it is combined with heat-clearing and fire-purging herbs such as Zhi Zi, Lian Qiao, Zhu Ye, etc. and sore-throat-alleviating herbs. For instance, it is combined with Shan Dou Gen, Lian Qiao and Jie Geng in Qing Liang San from Wan Bing Hui Chun (Rejuvenation of Thousands of Diseases) to treat sore and swollen throat due to heat-toxin accumulation. As a commonly-used blood-cooling and bleeding-stopping herb for being able to cool blood and stop bleeding, it can be used for hematemesis, hemoptysis, hemafecia and hematuria or metrorrhagia and metrostaxis due to blood heat. It is used singly or combined with other blood-cooling and bleeding-stopping herbs. For instance, it is used to treat hemoptysis and non-traumatic hemorrhage in Huang Qin San from Sheng Hui Fang. It is used singly to treat metrorrhagia and metrostaxis in Qin Xin Wan from Ben Shi Fang and Rui Zhu Tang Jing Yan Fang (Experimental Prescription from Ruizhu Clinic). It is combined with meridian-warming and blood-stopping herbs for treating hemorrhagia of deficiency cold. For instance, it is used with Zao Xin Tu, Fu Zi and E Jiao for treating hemafecia, hematemesis and metrorrhagia and metrostaxis etc. , as in Huang Tu Tang from Jin Kui Yao Lue. In addition, for its actions of clearing heat and preventing abortion, it can be used for insecurity of fetus or pregnancy bleeding caused by excess heat in pregnancy period going down to disturb blood sea to make the blood flowing out of the vessels or heat disturbing fetus. It is commonly combined with yin-nourishing and heat-clearing herbs such as Bai Shao, Sha Shen, Di Gu Pi, for instance, An Tai Yin from Chuai Mo You De Ji (Gain Collection from Thinking). It is combined together with blood-nourishing and abortion-preventing herbs such as Dang gui, Bai Shao, Bai Zhu, etc., as in case of blood deficiency with heat, for instance, An Tai Wan from Shou Shi Bao Yuan (Longevity and Life Preservation). Decoct 5~15g. It has stronger actions of clearing heat and drying dampness when using the raw one. For stopping bleeding and preventing abortion, the stir-baked one is better.